조선 태조 이성계의 초상화를 모신 곳이다. 태종은 1410년 전주·경주·평양에 태조의 모습을 그린 초상화를 모시고 어용전이라 하였다. 그 후 태종 12년(1412)에 태조 진전이라 부르다가 세종 24년(1442)에 와서 전주는 경기전, 경주는 집경전, 평양은 영숭전으로 달리 이름을 지었다. 경기전은 임진왜란 때 불탄 것을 광해군 6년(1614)에 다시 고쳐 지었다. 건물의 구성은 본전·헌·익랑 들로 이루어져 있고 이를 내삼문과 외삼문으로 둘렀다. 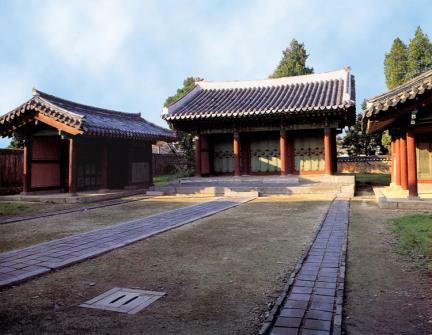 It is a place for enshrining a portrait of the first king, King Taejo or Yi Seong-gye of the Joseon Dynasty. King Taejong named as Eoyongjeon the place for enshrining a portrait of the first King in Jeonju, Gyeongju, and Pyeongyang in 1410 (AD). Later named Taejojinjeon in the 12th year (AD 1412) of the reign of King Taejong, each place was renamed again in the 24th year (AD 1442) of the reign of King Sejong: Jeonju as Gyeonggijeon, Gyeongju as Jipgyeongjeon, and Pyeongyang as Yeongsoonggjeon. Gyeonggijeon was burnt down during the Japanese Invasion of Korea in 1592 but was repaired and rebuilt in the 6th year (AD 1614) of the reign of King Gwanghaegun. 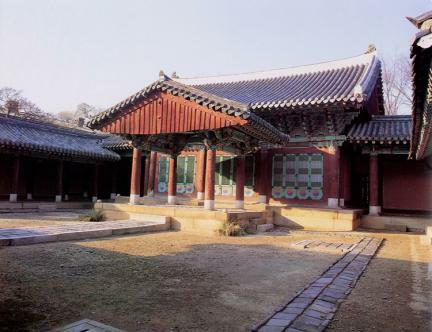 The structure of the building consists of Bonjeon (main hall), Heon (administration office), Ingnang (rooms on both sides of the main gate), etc. It is surrounded by Naesammun and Oesammun gates.